Successful people have it easy. Successful people get it right, right away. Successful people have an idea, then a plan, and then they take the step after step after step to get there. No problemo. 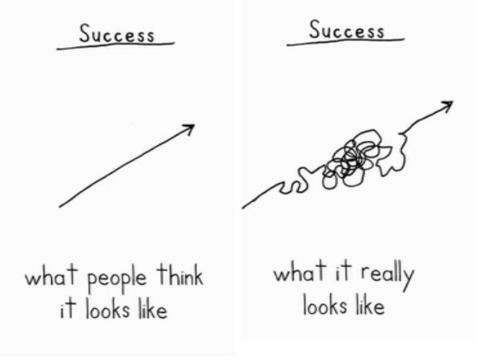 Here’s what success really looks like. It’s a circle, a square, a “one step forward, one step back” kind of a dance. It’s the side-step, the “oops, I went off track” step, the “how the heck did I end up here?” moment. It’s waking up with the dream sill intact, and your heart in tatters. It’s trying something, anything, to just keep it going. It’s celebrating the little successes along the way. Remembering everything you have in you that has got you this far–and will never go away. It’s trusting your heart, and using the brilliance of your mind. It’s remembering that the change cycle has four squares. And we often end up back in square one. Again. 2. Then this other thing happened. 5. And now I am here–in this great place BECAUSE of that sucky thing. One of my life coaching clients recently told me that, actually, every time her husband has lost his job he’s ended up with a better one, and a better paying one at that. Another of my life coaching clients recently told me that, actually, getting fired from her old job led to her getting her new job, which is FULL of better people and better opportunities. I lost the communications gig I left my full-time magazine editor job for, after about four months. The woman I was working for looked at her business bank account one day, and realized, oops, no more money to pay Lindsey with. Because of that, I had to learn how to apply my own communication skills to getting my own business up and running, while continuing to do the same for other clients on a contract basis. Because of that, I learned fast. And NOW I get to help accidental business owners do the same thing: Life Coaches, yoga teachers, massage therapists, reiki practitioners, spiritual teachers, chiropractors, naturopaths. People who started out just wanting to help people, and ended up having businesses…now I help them Market from the Heart in my 5-week program. A friend of mine who’s now working a dream gig said this to me the other day. Taking one step forward, one step back isn’t failure. It’s a dance. And that’s a tweetable @lindsey_lewis.